MADISON, Wis. — Drew Ott shared the defensive philosophy Iowa brought to Camp Randall Stadium in what became a Big Ten Conference-opening slugfest. "We kept saying, 'If they don't score, they don't win,'" the senior brute of a defensive end said. No. 19 Wisconsin even got to Iowa's 1-yard line Saturday, but it never crossed the goal line. And in front of 80,933 fans, the Hawkeyes emerged with a 10-6 win and a 5-0 record to effectively rubber-stamp their candidacy as a leading Big Ten West contender. "It was like a heavyweight fight out there. 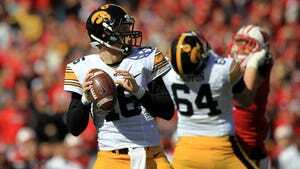 Back and forth," said Iowa quarterback C.J. Beathard, who went 9-for-21 for just 77 yards but improved to 6-0 as a college starter. "It was a sloppy game. Obviously, we didn't play as well as we wanted to offensively, but a win's a win." Iowa assembled a 4-0 nonconference record behind a clutch fourth-quarter offense that saved the day (or night) in wins over Iowa State and Pittsburgh. But Saturday was 'D' day for the Hawkeyes — a defense that displayed championship-level chops in Madison. The Hawkeyes stood tall, time after time. Wisconsin (3-2) got to the doorstep of a go-ahead touchdown with second-and-goal at the 1, with just under 8 minutes to go. But Nate Meier blasted through the middle of the Badgers' offensive line and disrupted the attempted handoff from Joel Stave, who stepped on a lineman's foot. Faith Ekakitie recovered for the turnover. It was a no-quit attitude on that sequence that Iowa coach Kirk Ferentz pointed to as — wait for it — a championship-type play. "If you expect to have a winning football team, a team that's going to have a chance to be a championship-caliber team, that's what you've got to do," Ferentz said. "That's got to be your mindset." 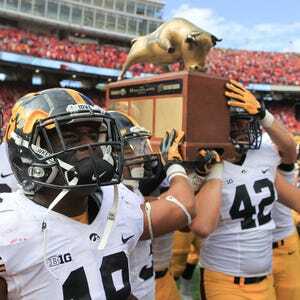 The Hawkeyes' ground-and-pound program held Wisconsin, which claims three Big Ten Championships and three Rose Bowls since 2010, without a touchdown on 12 possessions. The Badgers were stifled with 86 rushing yards on 34 carries — 2.5 yards a pop, with a long of 11. As you may recall, Wisconsin won its championships with a stout defense, just like Iowa did in 2002 and 2004. Iowa took note after a 7-6 disappointment in 2014 that if it was going to get back to contending in the Big Ten, it would have to center on defense. Despite getting outgained 320-221, Iowa forced four turnovers. Desmond King tallied two more interceptions, the first of which set up the game's only touchdown, a Beathard 1-yard pass to George Kittle in the second quarter. King also knocked out Wisconsin's top receiver, Alex Erickson, with a hard tackle in the third quarter. There was also a turnover forced by Ott — the Hawkeyes' premier defensive player entering the season who suffered a dislocated left elbow at Iowa State — on a sack-and-fumble that set up Marshall Koehn's 33-yard field goal. Yep, all 10 of Iowa's points came on short fields after turnovers. Ott was mostly ineffective the past two weeks, but Saturday he looked like more like the beast that dominated the Kids Day scrimmage on Aug. 15. "I think he's healthy again, based on what I saw today," Ferentz said. "He's been gaining ground every week. Today, he certainly looked like he was full-speed again. I really admire his toughness and courage, because he wanted to play the last couple weeks, especially the week after the injury. He wasn't very effective. But it wasn't because he didn't want to be out there. "He's back. That's a good thing for us." Whoever ultimately emerges in the Big Ten West will carry a lunch-pail defense. Iowa had that Saturday, and so did 5-0 Northwestern, which shut out Minnesota 27-0 and is allowing 7.0 points a game. "That's one of our goals, to have a championship defense," said strong safety Jordan Lomax, who had eight tackles and one thunderous pass breakup. "We can continue to get better. There was still some plays that we can ... fix. We're not where we want to be, but we are headed in the right direction." Saturday, it had to be almost perfect. And it almost was on the scoreboard, allowing only a pair of 46-yard field goals. It was the first time Iowa held a Big Ten foe without a touchdown since Penn State in 2010. Wisconsin drove to Iowa's 16-yard line in the final minute. On fourth-and-2, Stave's pass to tight end Troy Fumagalli sailed wide, with linebacker Cole Fisher (14 tackles) right there in coverage. That was Iowa on Saturday — all over the place, especially when it had to be. "We were just going all-out today," linebacker Josey Jewell said. "We've got to enjoy this one."